Previous image, 75 total items. Next image, 75 total items. Rejuvenate on idyllic beaches, explore mystical temples, browse galleries or cycle through the lush countryside of this famous island in the Indonesian archipelago. 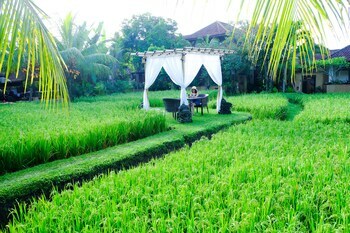 Bali’s attractions draw a range of people, from backpackers and expats, to families and honeymooners. This once sleepy tropical island has become world famous for its gorgeous beaches, rolling mountains and unique cultural, spiritual and artistic flair. Bali can be very cheap or moderately expensive, depending on your needs. Stay in a resort or hotel and book a tour, hire a private guide, jump in a taxi or bus, or rent a bicycle, motorbike or car to get around. The island’s most famous beaches are in North Kuta, just a short drive north from the international airport at Denpasar, Bali’s capital city. Kuta Beach and Legian Beach are a surfer’s paradise. 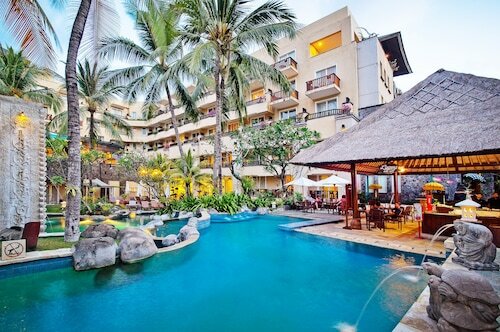 In the villages of Kuta and Legian, markets, bars, water parks and food outlets keep the crowds entertained. Head to Sanur Beach, on the east coast, to enjoy the relaxed atmosphere that makes this part of the island popular with families. Spend a few days inland, among the rice paddies and forests of Tegallalang Village or Ubud to see a more cultural side of Bali. Ubud is Bali’s artistic capital, so take your pick from the Puri Lukisan Museum, Neka Art Museum, Antonio Blanco Museum and the Arma Museum. 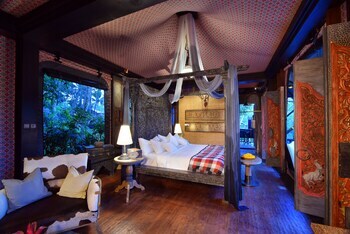 Take a yoga class, bike along rice paddies or see the macaques on the temples’ roofs in Ubud Monkey Forest. Don’t miss the mysterious Elephant Cave, and take a dip in the ninth-century Tirta Empul baths. South of Ubud, meet the animals at the Bali Zoo and Bali Bird Park. North of Ubud, in central Bali, is the Gunung Kawi Temple, carved into the mountain. In South Kuta is idyllic Jimbaran Beach. Head here to enjoy a seafood banquet with your toes in the sand. On the east coast of South Kuta is Nusa Dua with Mengiat Beach and the Pasifika Museum. On the southwest coast, the Uluwatu Temple sits atop rugged cliffs, one of the best places on the island to watch the famous Bali sunset. Learn about Bali’s connection with Hinduism and the Indonesian struggle for independence when admiring the architecture and dioramas of this temple-like structure. Uncrowded shorelines, beautiful blue water and a village with a laid-back atmosphere makes this beach an oasis of calm in bustling southern Bali. Enter a dense rain forest full of banyan trees and flowing streams to visit ancient Hindu temples and baths and see agile macaques swing in the treetops. Wax up your board and paddle out to one of the world’s best surf breaks, under one of Bali’s most beautiful temples. Ride a glass-bottom boat to this scenic island to find out about the conservation of turtles and prevention of illegal turtle trade. 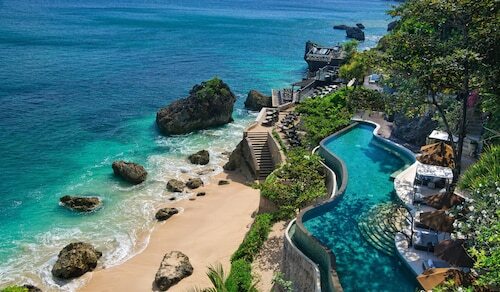 Relax on the idyllic beaches and see a temple complex and a museum in one of Bali’s most developed vacation spots. Eat fresh seafood in restaurants along the sand in this quiet fishing village away from the crowds of nearby Kuta. Join the surfers, stay at a luxury hotel and enjoy the seafood in the many restaurants near this scenic beach. This mysterious place just outside of Ubud houses a Hindu temple, statues, ponds and fountains from a time gone by. Attend this solemn and graceful reminder of the three-bomb attack that left hundreds from across the globe dead and injured. Wake in the morning to views of emerald-green rice fields then ride to breakfast on the back of a gentle Sumatran elephant. 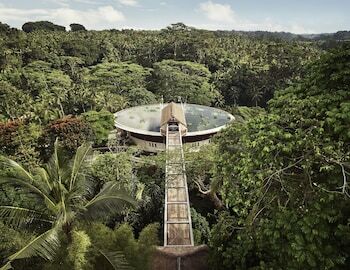 This extravagant hilltop retreat with gardens was once the home of “the Dali of Bali,” the man many consider to be the island’s most eccentric artist. 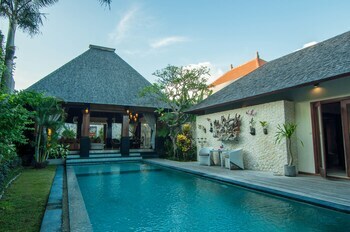 Immerse yourself in Balinese culture at this interactive center, enjoy a meal, or stay in the resort and relax in the peaceful natural setting. Join local worshipers, and photographers from all over the world, at one of Bali’s most scenic water temples. Discover the unique style of Balinese art at the island’s oldest art museum, established by a Dutch painter and the former prince of Ubud. Ride on an elephant, take a walk through the treetops and enjoy close encounters with the animals in this small zoo with a big heart. This impressive art museum is home to some of the most influential artists in Bali and gives insight into the development of Balinese art. Get up-close to some of the most stunning birds and butterflies in the world as they fly around you in this spacious park. These beautiful temples are some of the most fascinating in Bali. Carved into the rocks and bleached by time, they offer a glimpse into another era. 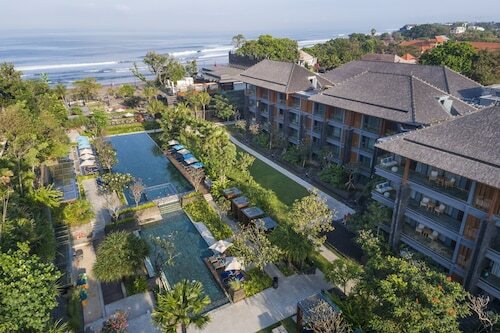 Panoramic views, perfect waves, stunning sunsets and nightlife await you at this hotspot for surfers and other vacationers in Bali. Spend a day in this upscale shopping complex with boutique stores, English books and designer clothing in one of Bali’s most elegant resort towns. Relax on a lounge chair, enjoy the gentle waves, get a massage, sip a tropical drink or ride a horse on this pleasant sandy beach along Seminyak’s waterfront. See a more traditional side of Bali and visit this 15th-century place of worship, where Hindus still come to make offerings during special ceremonies. One of the oldest temples in Bali is located atop rugged cliffs, a spectacular setting from which to enjoy the sun setting over the ocean. Stroll past rice terraces and pause under the shade of coffee and clove trees before cooling off at Bali’s most spectacular waterfall. 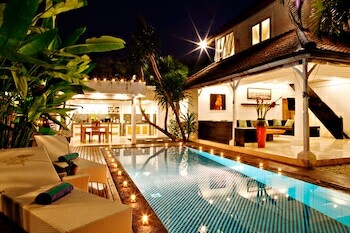 Relax in style at Seminyak Beach, with its high-end hotels, sumptuous spas and first-rate restaurants. Located in BTDC, this luxury hotel is within a 10-minute walk of Bali Collection Shopping Centre and Bali Nusa Dua Theater. Nusa Dua Beach and Bali Nusa Dua Convention Centre are also within 1 mile (2 km). Situated in the business district, this hotel is within 1 mile (2 km) of Segara Beach, Lippo Mall and Tuban Beach. Waterbom Bali and Discovery Shopping Mall are also within 2 miles (3 km). Located in Kartika Plaza, this luxury hotel is within a 5-minute walk of Discovery Shopping Mall and Waterbom Bali. Kuta Beach and Lippo Mall are also within 10 minutes. 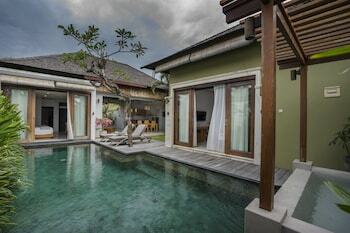 Offering direct access to the beach, this Dyanapura hotel is in the entertainment district and within a 10-minute walk of Seminyak Beach and Double Six Beach. Legian Beach and Eat Street are also within 1 mile (2 km). 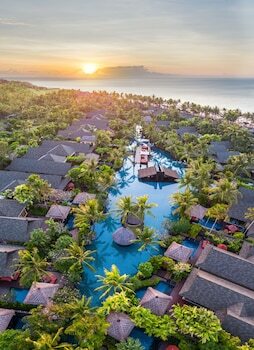 Located in BTDC, this luxury resort is within a 10-minute walk of BIMC Hospital Nusa Dua, Bali Nusa Dua Theater, and Bali Nusa Dua Convention Centre. 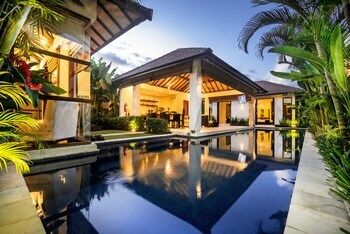 Nusa Dua Beach and Tanjung Benoa are also within 2 miles (3 km). Located in the heart of Tuban, this hotel is within 1 mile (2 km) of Circus Waterpark, Lippo Mall and Tuban Beach. Waterbom Bali and Discovery Shopping Mall are also within 2 miles (3 km). Situated near the beach, this spa resort is within a 15-minute walk of 3D Trick Art Museum DMZ, Double Six Beach and Seminyak Beach. Legian Beach and Eat Street are also within 1 mile (2 km). 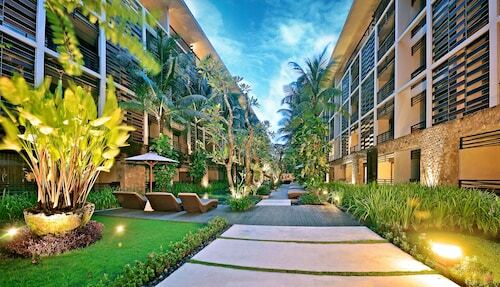 Nestled on the beach, this Bukit hotel is within 1 mi (2 km) of Samasta Lifestyle Village and Jimbaran Beach. Garuda Wisnu Kencana Cultural Park is 2.2 mi (3.6 km) away. Birmingham - Ngurah Rai Intl. LON-All Airports - Ngurah Rai Intl.